A prestigious office and retail complex conveniently located in mid-town Toronto, 245 Eglinton East is just minutes from the Eglinton subway system. This Building has excellent visibility from both Eglinton Avenue and Mount Pleasant Road and is only minutes from the City's financial district, the Don Valley Parkway and the 401. Numerous shops, restaurants, nightclubs and other amenities are within walking distance of 245 Eglinton East. Several athletic and fitness facilities are nearby. The Landlord has made the building more environmentally friendly by retrofitting the lighting, recycling, performing annual indoor air quality tests, providing bicycle facilities, using low flow plumbing fixtures with motion sensors and establishing a tenant green committee. The outside of the Building has a stunning combination of brick and gold reflective glass - a timeless design that incorporates the latest in materials and building technology. A dramatic, circular entrance lobby channels the flow of retail and office traffic in a highly effective way. The main lobby is situated on the southeast corner of Mount Pleasant Road and Eglinton Avenue. Vaulted ceilings, wall sconces, alcove seating and floors of flamed and polished granite combine to project a highly distinctive and progressive image. A custom designed sculpture of polished porino granite provides the complex with a distinctive and memorable focal point. The finest granite has been used throughout the main floor lobbies and public areas. Three newly refurbished elevators connect two levels of parking with the retail and office floors. Sophisticated electronic security and card access systems control after-hours entry to the building, parking garage and elevators. Elevators are finished with granite floors and handrails, tinted mirrors and indirect perimeter lighting. 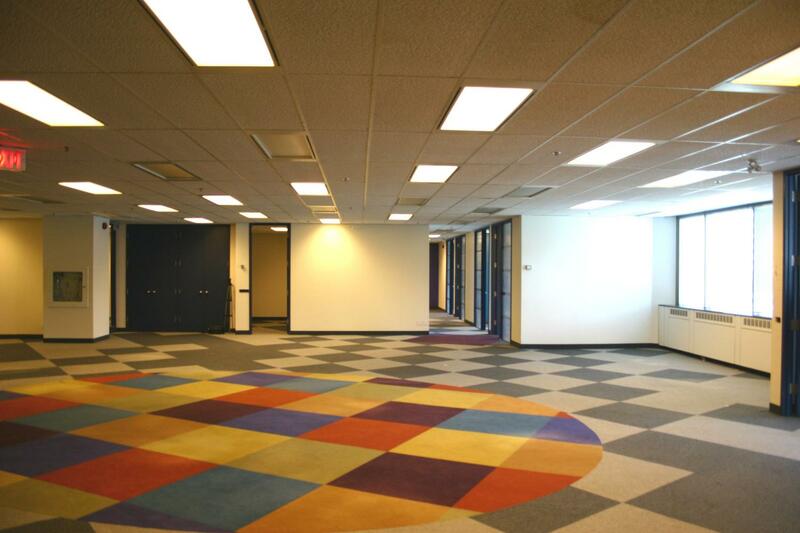 A flexible lighting system, employing recessed air handling luminaries, is used throughout the office floors. Wall sconces and recessed incandescent lighting complement the unique design of ground level lobbies and corridors. The floor plates are large at around 34,000 to 39,000 square feet depending on the floor, which makes for a very efficient space for large tenants where you do not have to travel up and down elevators as you would in most buildings. A beautifully landscaped interior courtyard provides an oasis of peace and tranquillity from the surrounding City noise - a welcome respite for all tenants. 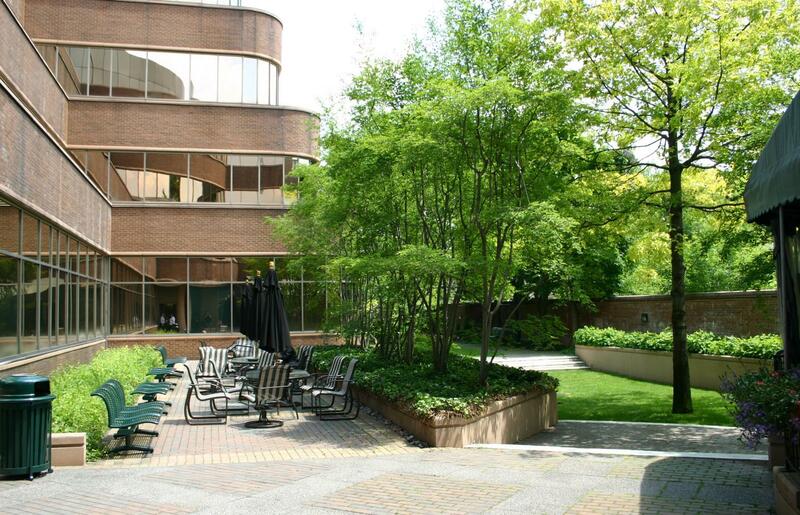 During the summer, benches, chairs, tables and umbrellas are placed in this outside courtyard for the tenants' enjoyment. Inside and out, 245 Eglinton East makes a bold statement in quality, refinement and good taste. The result ... an impressive, highly efficient complex of enduring beauty. 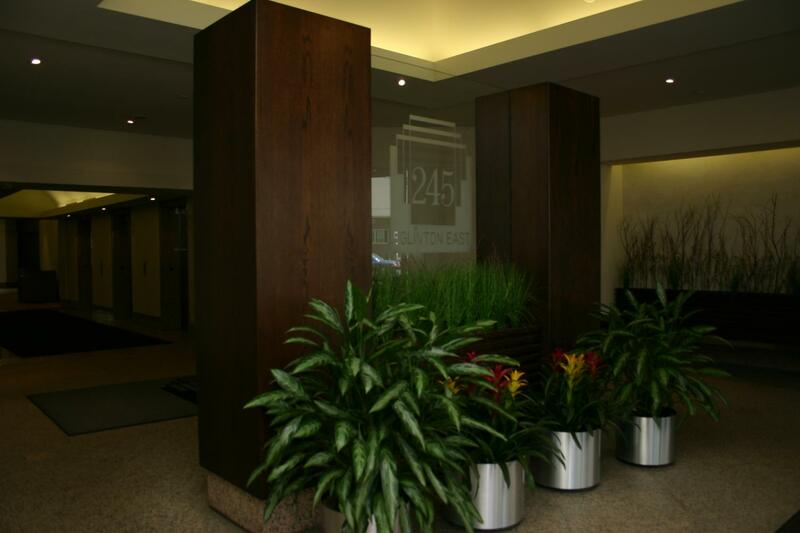 In every respect, 245 Eglinton Avenue East is an address of which even the most discriminating will be proud.